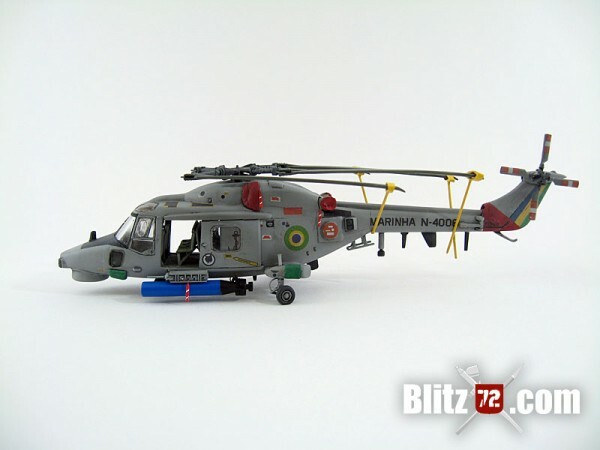 Home > Aircraft > Brazilian Navy Super Lynx Samba! Brazilian Navy Super Lynx Samba! 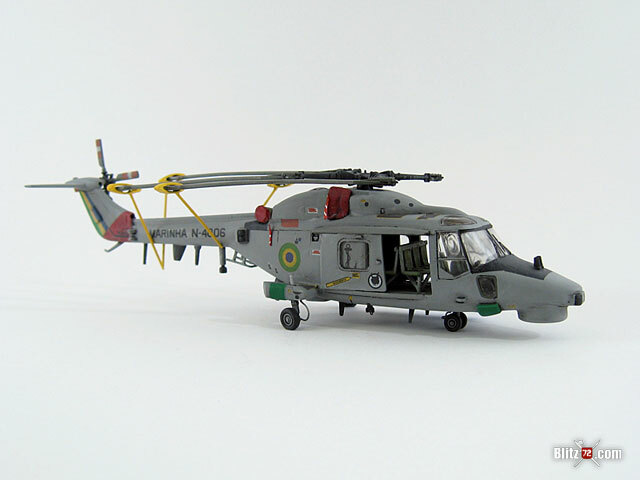 Airfix’s boxing of the Westland Lynx helicopter in 1/72 scale gets a face-lift and a rather flamboyant paint scheme worthy of a Brazilian carnival! 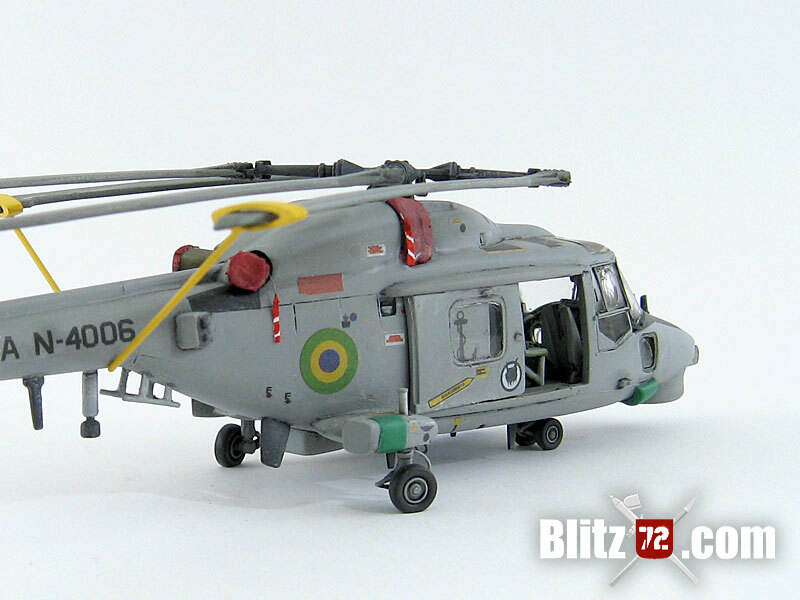 If you checked the work in progress article for this Lynx model, this started as a “quick build” but ended up being a more complicated project while I struggled to detail and correct most of the shortcomings on Airfix’ #03063 “Westland Navy Lynx Mk8″ kit. This boxing comes with all the original HAS 2 parts that hail back from 1970s, plus the new Mk 8 parts in a new sprue. These new parts are actually of very soft detail and need some degree of effort to integrate seamlessly onto the rest of the original parts. One of these pieces that is guaranteed to give you some headache is the new nose, doesn’t matter how you glue it to the rest of the fuselage you will end up with a 1mm step either on top or below, and half of that at each side. My solution was cutting 1mm of the original HAS 2 nose, right at the base and using that part as a plug between the fuselage and the new part. In order to save space I like to have my helicopters with rotors folded whenever possible. So very early in the build I decided to go that way slicing the main rotors and scratchbuilding the folding hinges and supports. 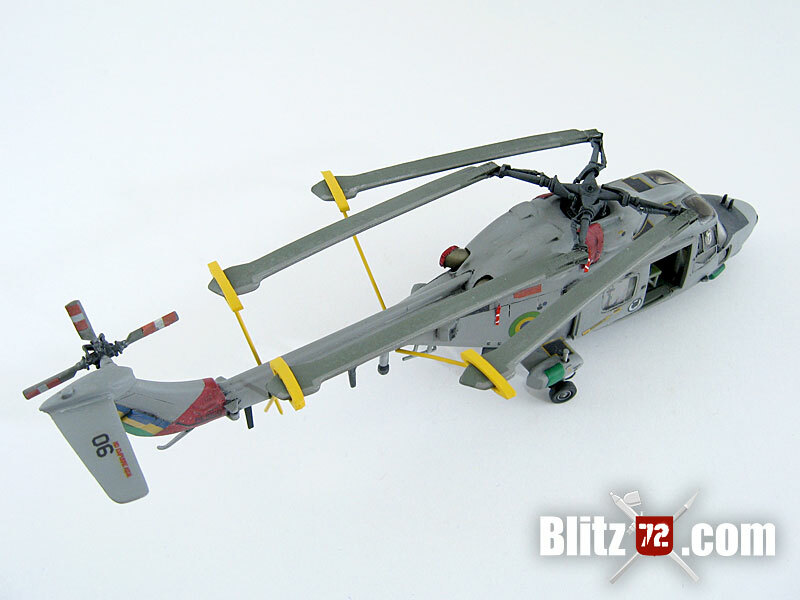 The worst and larger shortcoming of all the model kits ever made of the Lynxhelicopter, in any version or scale, are the intake FOD guards. Nobody got that right; Hobby Boss includes a transparent part for it (? 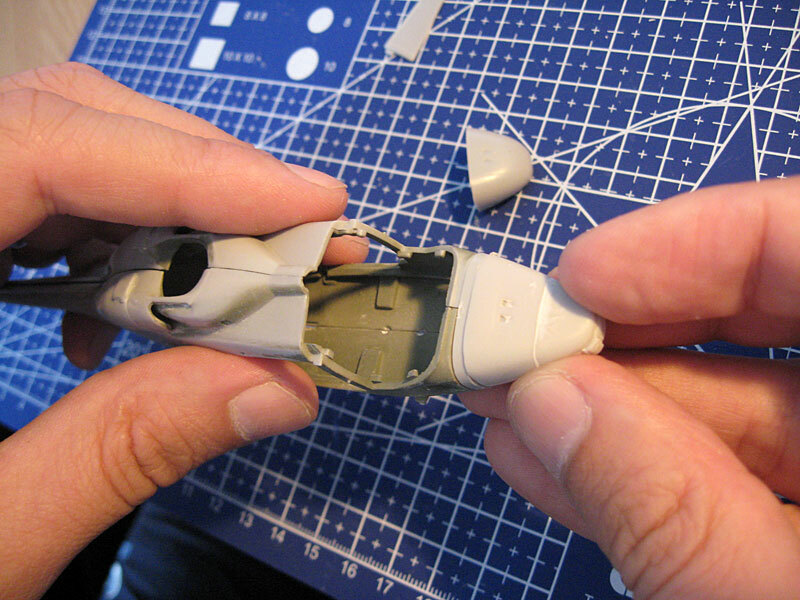 ), Fujimi moulded it solid over the fuselage and in this case Airfix just completely ignored the thing. Save for a very few set of pictures, you won’t see a modern Lynx going around without them, so I needed to do something about it. I created intake covers by using two component epoxy putty placed directly over the kit part and just before it was set I transferred some “texture” to it by sculpting some wrinkle detail and pressing a fabric over it. The exhaust covers were made with masking tape. Sounds way more complicated than it really is, it took me probably 20 minutes to do both. The Brazillian interior has nothing to do with that the kit suggests. Don’t use the inflatable seat Airfix provides for the Mk 8, instead use the regular seats from the HAS 2 (present in the kit) and place them facing front and back (not facing at the sides like in regular British fashion). Some detail was added to the basic cockpit using masking tape belts and some plastic card. On the exterior most of the antennas in the belly and below the boom had to be scratched from plastic. Same goes for the side “dish”, as Airfix just provides a round red decal for it. Pictures show that to be a prominent detail so I had to add that using plastic sheet and an old wheel from a Heller F-104 sanded to shape. The landing gear got some TLC in the form of cooper wire brake lines. Another conspicuous feature of the shipborne versions of the Lynx is its ability to “twist” the main landing gear outwards by 27 degrees. This “crooked” stance prevents the helo from rolling off the rocking deck of a ship while also allowing it to rotate over its own axis while on land. I just had to depict that on my model. The side pods were lacking any detail of the inflatable emergency devices so I simulated that by masking the area and brush “painting” diluted Revell Plasto putty. As soon as it was applied I removed the masking tape. When dry some soft sanding eliminates any excess roughness of the texture. Last but not least the torpedo station left a lot to be desired, so I added some detail to that as well with plastic, and a steel tube. The model was painted using acrylics exclusively. The main color is Gunze #317. 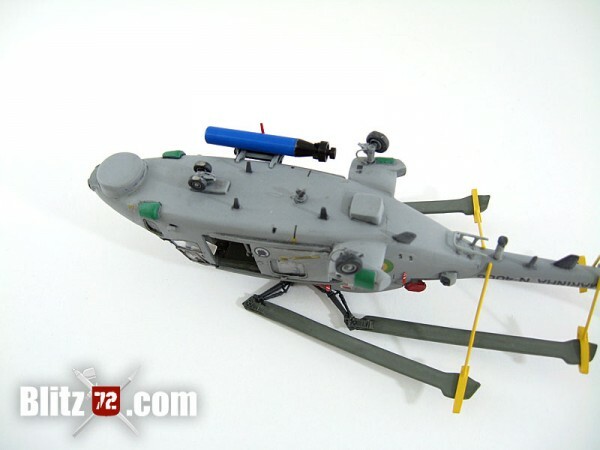 Amazingly enough I used Tamiya’s RLM 02 equivalent for the interiors and rotors, and an RLM 66 equivalent for the rotor head. Looked like a close match to my references. The rest is all Revell Aqua acrylics. 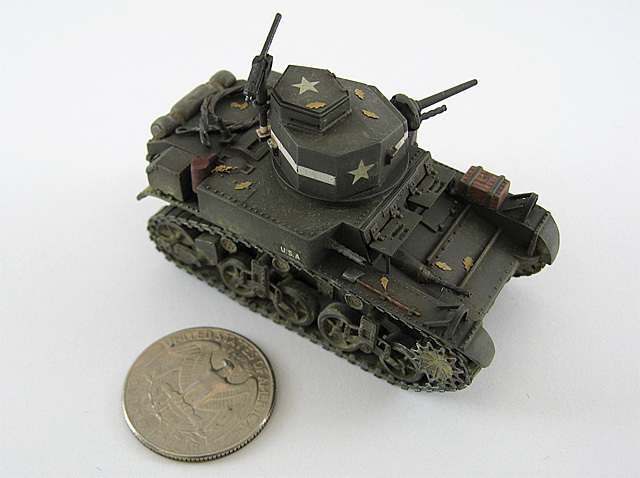 Model was coated with gloss clear and decaled using the kit provided decals which were absolutely AWFUL. They don’t react well to any softener I have and are super translucent. My hair turned white at the sight of those bright Brazilian colors going darker over the grey base coat. The worst decal was the rudder one that just didn’t conform at all. So I had to paint that and match the colours to the roundels (wrong, but already in place). Nothing new here, just a pin wash with oils. I saw these birds live when I as living in Rio, and they were all kept in top notch condition. Not a single hint of dirt or grime on them, so I kept the weathering light on this one. I’m really pleased with the way this model turned out after almost 18 months of working on and off. 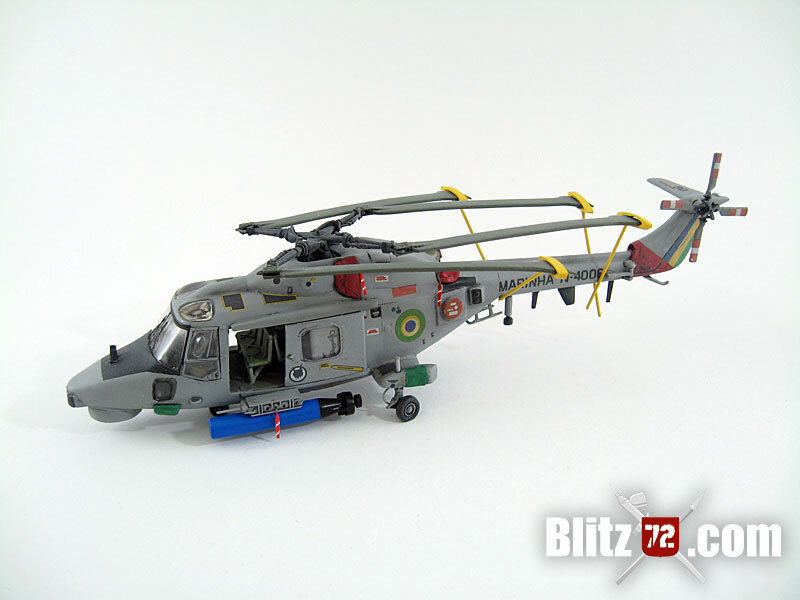 The Lynx is one of my favorite helicopters and as said I just had to build it in Brazilian livery. Would I do it again?. Now that Hobby Boss is in town I probably won’t. 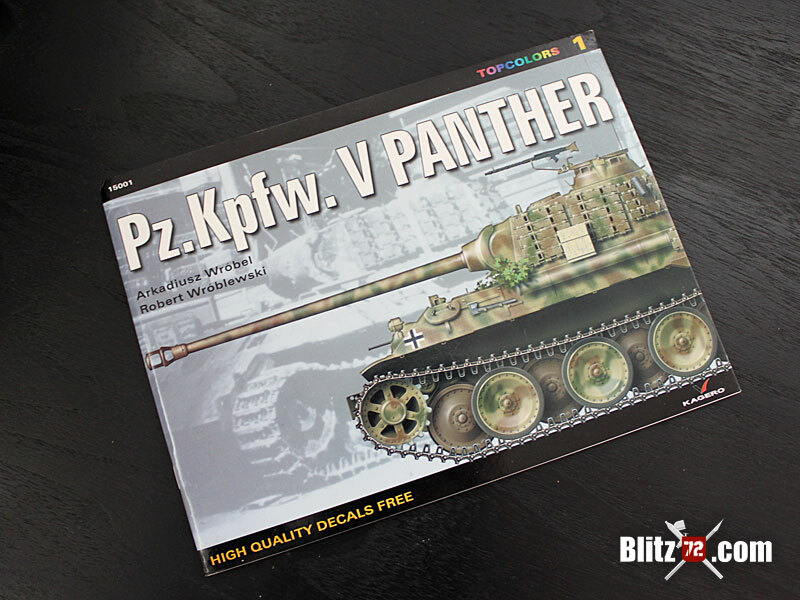 However I do happen to have another box of this kit in the stash which means I’ll probably build a HAS 2 from it as the original 1970s parts fit way better than the “new” ones. All in all I’m happy to have this pup (no pun intended) on my collection, and hope you enjoyed it as much as I did. There are two errors I didn’t correct on my model mainly because I was too advanced in the build when I found out. The exhausts are totally wrong on this kit, they should pop at a side directly not curve outwards as it is ni the Airfix kit. Both Hobby Boss and Fujimi got it better. The second one is the small window at the nose sides. They should be square, again Hobby Boss and Fujimi nailed that spot on. I’m still happy with the model even if I know it has these errors, but I wanted to mention this in case you are planning for further improvement. 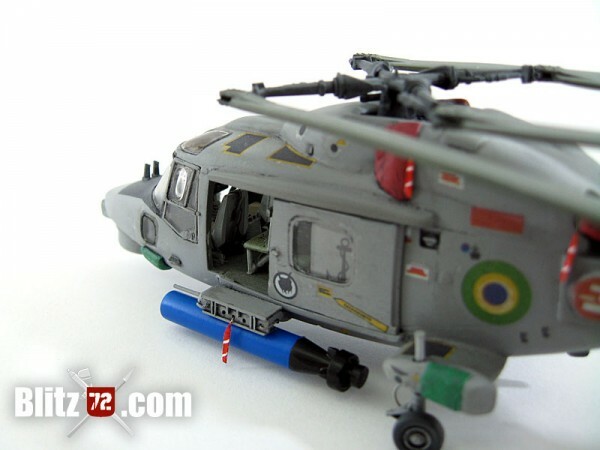 I actually found this particular post , “Airfix Brazilian Navy Super Lynx Samba! | Blitz72.com”, pretty pleasurable and also the post ended up being a superb read.